Growing up as a self-described “hybrid farm-kid,” Kim Williams was raised in Great Bend, Kan., but assisted her family on her grandparents’ farm. She graduated from Kansas State University with her Bachelor of Science in horticulture in 1988, then completed graduate work at North Carolina State University in 1995, earning Master of Science and doctorate degrees. 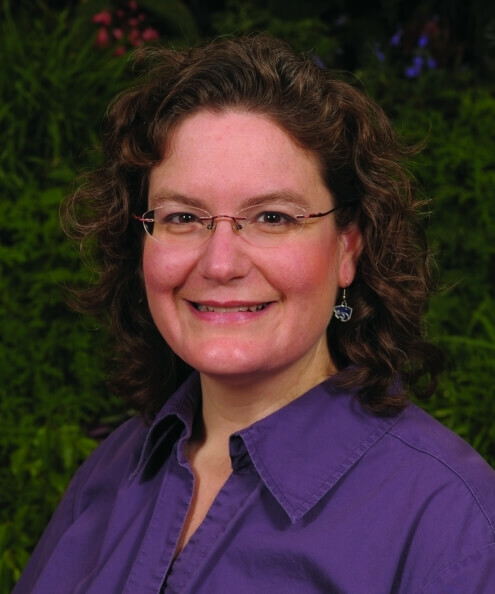 Williams’ first position was as an assistant professor at the University of Illinois until 1997 when she returned to KSU as a member of the faculty. She has a 60 percent teaching and 40 percent research appointment, and she was promoted to the rank of professor in 2006. In 2010, she was recognized as University Distinguished Teaching Scholar. Her expertise on plant production in controlled environment structures has resulted in her giving invited presentations around the U.S. and Canada, and she is currently co-authoring a book about water and nutrient management for floral crops. She focuses her research on solving greenhouse industry problems. Williams really enjoys advising 25 to 30 students who are specializing in crop production disciplines, and she enjoys linking them to national floriculture industry scholarships and awards. Her students have been awarded over $100,000 in industry scholarships during the past decade. Williams and her family enjoy traveling, and they visit greenhouse operations at every opportunity. She stays active with her young daughter and does her best to keep up on current events when she is not on the job.